Abdominal computed tomography (CT) scanning has revolutionized patient care in the past two decades. The introduction of CT technology is widely viewed by medical practitioners as one of the major medical advances. Abdominal CT scanning is used in the evaluation of trauma victims for visceral injury  and in the evaluation of acute abdominal pain, with a major role in the evaluation of renal calculi,  acute appendicitis,  and complex abdominal pathology (see the images below). It is also the gold standard in identifying abdominal injury in children. [6, 7] Appropriate precautions must be taken prior to the scan to ensure that the patient has adequate renal function and no history of allergy before prescribing intravenous iodinated contrast. [8, 9] The technologist will have a direct discussion with the patient to review the risks and refer any issues identified to the radiologist. Informed consent and counseling is required for patients categorized as high risk according to the clinic or institutional policy. Technologists are usually certified to obtain verbal consent for uncomplicated cases, but, for written consent, a physician must review risks and benefits with the patient directly. CT of the abdomen and pelvis using oral and IV contrast; a reformatted coronal image is shown. A 67-year-old male presented to the emergency department with sharp right lower quadrant abdominal pain . 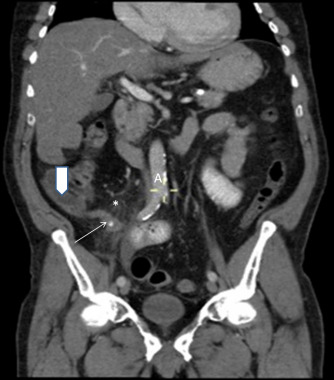 The appendix, seen here as an enlarged tubular structure in the right lower quadrant (small arrow), demonstrates diffuse wall thickening and contains a central appendicolith. There is associated periappendiceal fat stranding (*). The adjacent cecum appears thickened and demonstrates characteristic wall enhancement (large arrow). Findings were consistent with acute appendicitis with a surrounding inflammatory response. Diffuse abdominal aortic calcifications are incidentally noted (A). CT of the abdomen and pelvis without contrast; a reformatted 5-mm coronal image shown. 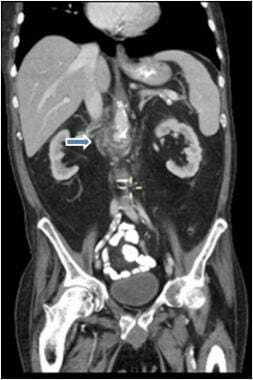 An 81-year-old male presented with acute left flank pain and macroscopic hematuria. 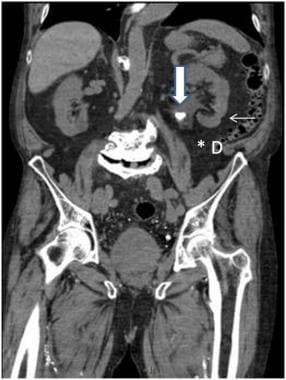 A large, 1.5-cm partially obstructing stone is seen at the level of the left ureteropelvic junction (large arrow). There is associated periureteral stranding (*). Scarring is noted in the lower pole of the left kidney (small arrow). Incidental note is made of colonic diverticulosis without diverticulitis (D). CT of the abdomen and pelvis using PO and IV contrast. A reformatted 5-mm coronal image is shown. A 66-year-old male presented with a history of coronary artery disease, chronic renal insufficiency, ostomyelitis of the foot, and 6 days of constant abdominal pain. Contrast is seen extending beyond the calcified abdominal aortic lumen at, and below, the level of the origin of the renal arteries, with a contained saccular portion measuring 3.4 X 1.7 X 2.7 cm (representing a pseudoaneurysm or a contained dissection secondary to an atherosclerotic ulcer). The patient's condition worsened, and he had MRSA sepsis. At surgery a mycotic aneurysm was found. CT colonography with oral contrast tagging is shown. A coronal CT reformat is shown on the left; a companion 3D-reconstruction colonography image of the same patient is shown on the right. An 89-year-old male with iron deficiency anemia presented for colorectal cancer screening. The patient was felt to be high risk for optical colonoscopy secondary to sedation risk. On both the coronal CT image and the reformatted image, a 4-cm mass is seen protruding into the lumen of the cecum, consistent with cecal carcinoma beyond the valve (white arrows). Multiple polyps were also identified during the procedure (not shown). The findings were confirmed by optical colonoscopy. Abdominal CT scanning is used in the emergency setting to diagnose complex intra-abdominal conditions, to differentiate causes of bowel obstruction, and to evaluate complications of hernia, pancreatitis, biliary obstruction, acute vascular compromise, and abdominal aneurysm. Multidetector CT (MDCT) has a major role in characterization and staging of tumors of the liver, pancreas, kidneys, bowel, reproductive organs, and lymphatic system. It also has a role in screening for hepatocellular carcinoma  and colon carcinoma using virtual colonoscopy. [11, 12, 13] It is also used in surgical treatment planning and in the diagnosis of postoperative complications. Scan protocols are adapted for the specific diagnostic problem, and the images are reformatted for viewing on picture archiving and communication system (PACS) workstations. Additional manipulation can be done on PACS or dedicated workstations, providing for multiplanar and 3-dimensional views of organs, vessels, and bones. With the use of appropriate luminal and intravenous contrast agents, information can be obtained on lesion characteristics based on tissue attenuation changes, detailed 3-dimensional arterial anatomy, and/or luminal surface contour (eg, in virtual colonoscopy). The patient is optimally positioned on the CT scanner table. As the patient is advanced into the scanner, he or she is coached by the technologists, who have direct visualization and bidirectional auditory communication with the patient as the study is performed. Typically, the patient is warned to anticipate the effects of contrast injection is informed about breath-holding requirements during the scan. The technologists select the correct protocol for the prescribed examination and select exposure parameters, taking into consideration factors such as the patient’s body habitus, in order to optimize image quality while limiting radiation exposure. Rubin GD. Computed tomography: revolutionizing the practice of medicine for 40 years. Radiology. 2014 Nov. 273 (2 Suppl):S45-74. [Medline]. [Guideline] Sudakoff GS, Yucel EK, Rosen MP, Francis IR, Baum RA, Foley WD, et al. ACR Appropriateness Criteria® blunt abdominal trauma. acr.org. Available at http://www.acr.org/Search?q=abdominal%20ct%20trauma. Accessed: 7/9/2012. [Guideline] Coursey CA, Casalino DD, Remer EM, Arellano RS, Bishoff JT, Dighe M, et al. Appropriateness Criteria® acute onset flank pain -- suspicion of stone disease. acr.org. Available at http://acsearch.acr.org. Accessed: 7/8/2012. [Guideline] Rosen MP, Ding A, Blake MA, Baker ME, Cash BD, Fidler JL, et al. ACR Appropriateness Criteria® right lower quadrant pain--suspected appendicitis. J Am Coll Radiol. 11/2011. 8(11):749-755. [Medline]. [Full Text]. [Guideline] Acute (Nonlocalized) Abdominal Pain and Fever or Suspected Abdominal Abscess. acr.org. Available at http://www.acr.org/Quality-Safety/Appropriateness-Criteria/Diagnostic/Gastrointestinal-Imaging. Accessed: 7/9/2012. Fahimi J, Kornblith AE, Kanzaria H, Herring A, Wang RC. Computed Tomography Use Plateaus Among Children With Emergency Visits for Abdominal Pain. Pediatr Emerg Care. 2017 Aug 14. [Medline]. Lynch T. Pediatric Abdominal Trauma. Curr Pediatr Rev. 2017 Aug 14. [Medline]. Herts BR, Schneider E, Poggio ED, Obuchowski NA, Baker ME. Identifying outpatients with renal insufficiency before contrast-enhanced CT by using estimated glomerular filtration rates versus serum creatinine levels. Radiology. 2008 Jul. 248(1):106-13. [Medline]. Namasivayam S, Kalra MK, Torres WE, Small WC. Adverse reactions to intravenous iodinated contrast media: a primer for radiologists. Emerg Radiol. 2006 Jul. 12(5):210-5. [Medline]. Chalasani N, Horlander JC Sr, Said A, Hoen H, Kopecky KK, Stockberger SM Jr, et al. Screening for hepatocellular carcinoma in patients with advanced cirrhosis. Am J Gastroenterol. 10/1999. 10:988-93. [Medline]. [Full Text]. Burt RW, Barthel JS, Dunn KB, David Ds, Drelichman E, Ford JM, et al. NCCN clinical practice guidelines in oncology. Colorectal cancer screening. J Natl Compr Canc Netw. 2010. 8:8-61. [Full Text]. Behrendt FF, Mahnken AH, Stanzel S, Seidensticker P, Jost E, Günther RW. Intraindividual comparison of contrast media concentrations for combined abdominal and thoracic MDCT. AJR Am J Roentgenol. 2008 Jul. 191(1):145-50. [Medline]. Camera L, Romano F, Liccardo I, Liuzzi R, Imbriaco M, Mainenti PP, et al. Balancing Radiation and Contrast Media Dose in Single-Pass Abdominal Multidetector CT: Prospective Evaluation of Image Quality. Acad Radiol. 2015 Aug 8. [Medline]. [Guideline] Multi. ACR Manual on Contrast Media. ACR. Available at http://www.acr.org/Quality-Safety/Resources/Contrast-Manual. Goergen SK, Rumbold G, Compton G, Harris C. Systematic review of current guidelines, and their evidence base, on risk of lactic acidosis after administration of contrast medium for patients receiving metformin. Radiology. 1/2010. 254(1):261-9. [Medline]. [Full Text]. Buty M, Xu Z, Wu A, Gao M, Nelson C, Papadakis GZ, et al. Quantitative Image Quality Comparison of Reduced- and Standard-Dose Dual-Energy Multiphase Chest, Abdomen, and Pelvis CT. Tomography. 2017 Jun. 3 (2):114-122. [Medline]. Vaccaro JP, Brody JM. CT cystography in the evaluation of major bladder trauma. Radiographics. Sep-Oct 2010. 20(5):1373-81. [Medline]. [Full Text]. Ilangovan R, Burling D, George A, Gupta A, Marshall M, Taylor SA. CT enterography: review of technique and practical tips. Br J Radiol. 7/2012. 85(1015):876-86. [Medline]. [Full Text]. Johnson CD, Herman BA, Chen MH, Toledano AY, Heiken JP, Dachman AH, et al. The National CT Colonography Trial: Assessment of Accuracy in Participants 65 Years of Age and Older. Radiology. 5/2012. 263(2):401-408. [Medline]. [Full Text]. European Society of Gastrointestinal Endoscopy, European Society of Gastrointestinal and Abdominal Radiology. Clinical indications for computed tomographic colonography: European Society of Gastrointestinal Endoscopy (ESGE) and European Society of Gastrointestinal and Abdominal Radiology (ESGAR) Guideline. Endoscopy. 2014 Oct. 46 (10):897-915. [Medline]. Frush P. Radiation, CT, and Children: The Simple Answer Is … It's Complicated. Radiology. 7/2009. 252(1):4-6. [Medline]. [Full Text]. Pearce MS, Salotti JA, Little MP, McHugh K, Lee C, Kim KP, et al. Radiation exposure from CT scans in childhood and subsequent risk of leukaemia and brain tumours: a retrospective cohort study. Lancet. 6/2012. [Medline]. [Full Text]. Koo CW, Shah-Patel LR, Baer JW, Frager DH. Cost-effectiveness and patient tolerance of low-attenuation oral contrast material: milk versus VoLumen. AJR Am J Roentgenol. 2008 May. 190(5):1307-13. [Medline]. Marin D, Nelson RC, Rubin GD, Schindera ST. Body CT: technical advances for improving safety. AJR Am J Roentgenol. 7/2011. 197(1):33-41. [Medline]. [Full Text].